Recent decades have seen a resurgence of scholarly interest in the phenomenon of civil war at Rome and how survivors coped with this. However, the question of what impact the civil wars had on Roman religion remains understudied. 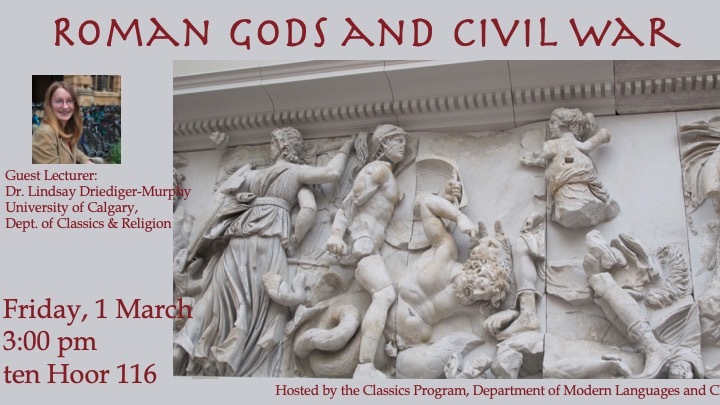 In this talk, I will argue that civil war posed problems for Romans on a divine level, as well as a human one. Like human beings, the gods were perceived as facing the question of what to do and what side to take during civil war. This issue forced Romans to think about, and characterize, their gods in new and unusual ways. Roman civil wars thus created the space for Romans to explore the more problematic sides of their understanding of the nature of their gods, and the nature of divine action in the human world. Biography: Lindsay Driediger-Murphy completed a BA (Hons.) in Greek and Roman Studies at the University of Calgary (2005), followed by an MPhil (2007) and DPhil (2011) in Ancient History at the University of Oxford, UK. She taught as a Stipendiary College Lecturer in Ancient History at Oriel and Jesus Colleges (University of Oxford, 2011-2013) before joining the University of Calgary's Department of Classics and Religion in 2014. Her research interests include Roman divination, ancient and modern conceptualizations of religion, interactions between religions in antiquity, and Greek and Latin historiography. She has published in such journals as Phoenix, ZPE, and GRBS. Her monograph Roman Republican Augury: Freedom and Control is currently in press with Oxford University Press. Her current research project is a study of 'The Nature of Roman Gods', supported by the Social Sciences and Humanities Research Council of Canada.